100% Risk-Free 30-day trial. No obligation, can cancel anytime. 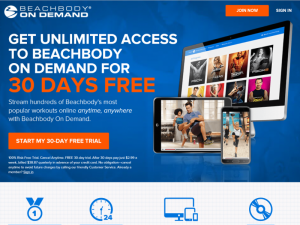 Beachbody On Demand is a new feature of the Team Beachbody Club and a new stand alone video service that provides unlimited access to stream Beachbody's proven fitness programs. Subscribers will be able to work out anytime, anywhere. All that is required is an internet connection and a web browser on your laptop, tablet, or smart phone. No other program is required. In the Beachbody On Demand video library there is over 150 top selling fitness titles plus new professionally created workout HD videos are being added every month. All of the popular Beachbody celebrity trainers are here. You will find Sagi Kalev with Body Beast, Chalene Johnson with PiYo, Shaun T with Insanity, Tony Horton with P90X, and Autumn Calabrese with 21 day Fix and 21 Day Fix Extreme. Not all programs are included but as an all-access Beachbody On Demand member, you go straight to the head of the line whenever Beachbody introduces something new. This is not a sneak peek, you will actually get to try a full workout from each of the latest cutting-edge programs like 21 Day Fix, Body Beast, CIZE, FOCUS T25, and PIYo. If you enjoyed the workout you can go ahead and purchase the full program. This program will then be added to your Fitness premium library on the Beachbody On Demand service and can be played anytime and anywhere just like the rest of the exercise videos. DVD programs purchased from Beachbody, Team Beachbody, or the Beachbody Amazon storefront will also be added to your premium library. When you purchase the premium programs through the On Demand service, subscribers also receive an additional 10% off the price. 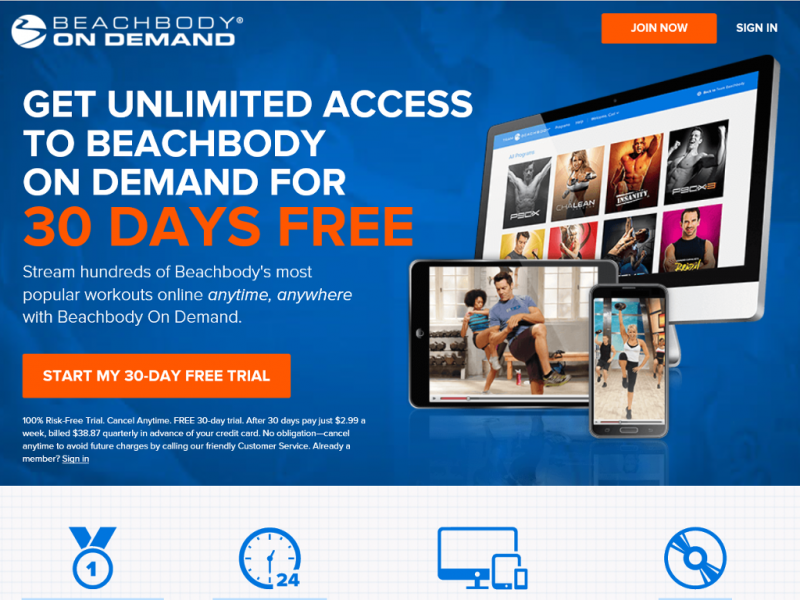 Beachbody On Demand subscription costs depends on which streaming plan you go with. You start off with a 30 day free trial. All plans are billed as one payment and will automatically renew for the same term and price until cancelled. The 6 and 12 month subscription can be cancelled within 30 days for a full refund if you are not satisfied. * Prices usually based on monthly subscription. Prices may increase/decrease depending on subscription length. All prices in USD unless specified other wise. Costs and features offered last checked February 06, 2017. Along with some of the programs like the PX90 series you will also get online access to meal plans designed by the trainers and certified nutritionists. These meal plans are customized for your unique lifestyle and the goals of the program. General recipe and other healthy meal tips are also available on the Beachbody website. When you sign up for the Beachbody On Demand service one of the features you will receive is called the "Challenge Du Jour". 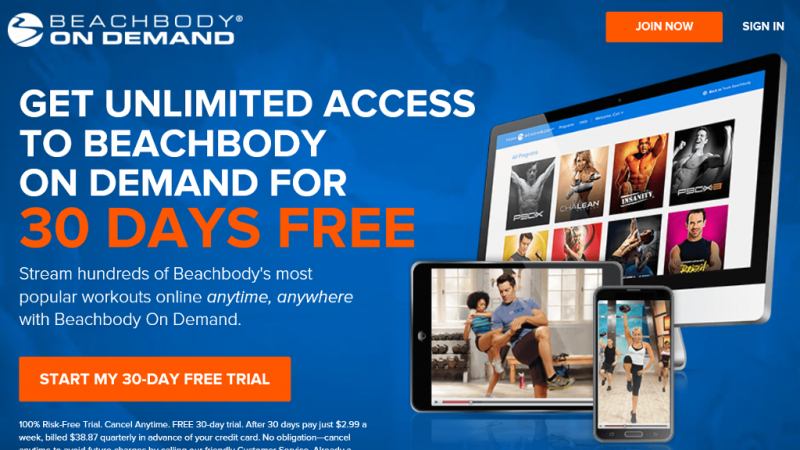 This is a daily rotation of workouts selected from different programs in the Beachbody Catalogue, as well as new monthly workouts performed by Beachbody Live Master Trainers exclusive to Beachbody On Demand. The rotation of workouts is carefully chosen to create an overall balanced fitness regimen. Master Trainer Challenge Du Jour is a special Challenge Du Jour that is always available. Master Trainer CDJ can be accessed through the Challenge Du Jour or Master Trainer pages. Through out your subscription members will have VIP access to celebrity Beachbody trainers and experts. Scheduled chats will be setup where you can ask your favorite Beachbody trainer any questions you may have on their workouts. You will also receive guidance and motivation from them through these chat sessions. Beachbody also has message boards which are very popular. Beachbody trainers have been known to pop on these forums and answer members question and offer insightful tips. The message boards contain categories on expert advice about Fitness, Nutrition, Supplements, Recipes, and the Beachbody Challenges. You will also find topics on specific Beachbody workout programs along with before and after photos from members. Beachbody has been doing fitness a long time now and they have many celebrity trainers. There fitness video collection is huge and covers everything from strength training to dance aerobics. You will not get bored with the selection you get and with the low price, it is many times cheaper than a regular gym membership and on par with other competing online fitness services. With streaming videos their are some negative points. First off streaming from your phone or tablet doesn't offer a big screen. Hopefully you can mirror the image on your TV or use a smart TV with a web browser to access Beachbody where you normally do workouts. You also don't actually own the content but just rent it (this doesn't apply to premium content that you do purchase). This means when you stop your subscription you don't have access to the videos anymore unlike with DVDs which you own. Beachbody is a great app! Beachbody on demand is much better than dealing with DVDs. I just use my Amazon Fire Stick and log into the app and I have plenty of choice of different fitness programs. This app has allowed me and my wife to try out Pliyo, T25 and Insanity Max 30 without making a huge investment and buying all the DVDs. Also with both of us using Beachbody it works out to just over 5 bucks a person. This is much cheaper than a gym membership. Need the internet to use. Not so good at our cottage. Works greak on my Roku I have hooked up to my TV. I have had zero problems with the app and streaming the high definition videos. This year I have promised myself to get healthy and loose weight. So I joined Weight Watchers a few months ago to help my diet and for some physical activity I decided on Beachbody On Demand. The reason I choose BOD was because it offered a wide selection of different videos from a number of different trainers. I have some of Beachbodies DVDs and they were helpful at the time though I grew bored watching the same video over and over again. 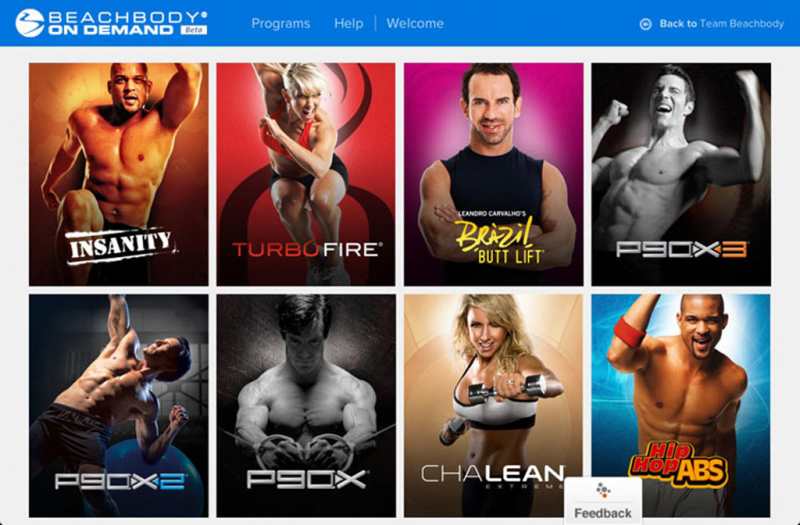 This shouldn't be a problem now with the selection Beachbody offers online. The price is also really good and better than other comparable services like Daily Burn which I have seen a lot of commercials for lately. No more DVDs. Selection of videos. Trainers that are motivating. Less than $10 a month. I can take it to the cottage. 30 day trial requires credit card. I have been slowly switching from using DVDs to streaming services. I have about 10 DVDs in my collection from Beachbody. Some of them are a little old now but obviously still give results. The problem is I am bored of them now and I can do most of the exercise routines by heart. When I heard of the Beachbody on demand service I was pretty excited. For the last 3 months I have had almost the whole Beachbody library at my finger tips. It's great as I always have new content to try for what ever the newest fitness craze is. I haven't had any problems with the video streaming and the website is easy to use.